When the Grateful Dead first played Denver in September 1967, they had made only two previous forays away from the West Coast: to New York in the spring of that year (a couple of weeks to promote their first album, made possible by the support of Warner Bros. Records) and to Toronto, Montreal, and Detroit in early August, most of that courtesy of Bill Graham, who brought the Dead and the Airplane east to represent “The San Francisco Scene.” The Dead’s maiden Colorado shows also had a San Francisco connection--Chet Helms, proprietor of S.F.’s Avalon Ballroom, opened the Family Dog ballroom on West Evans Street in Denver that September and brought in top bands each weekend, including Frisco faves the Dead, Airplane, Big Brother, and Quicksilver, and top L.A. Groups like The Doors, Buffalo Springfield, Canned Heat, and The Mothers of Invention. The ballroom had the requisite trippy light show and big, enthusiastic crowds most nights. After all, then and now, Denver/Boulder (home of the University of Colorado) had the largest hippie community between the coasts, so the Dead found a land full of kindred spirits there in the shadow of the Rockies. The Denver Dog didn’t survive long--only about nine months--mostly because local bureaucrats and intolerant police relentlessly hassled Helms’ people and, eventually, the ballroom’s patrons. Still, the love affair between the Dead and Denver was clear for everyone to see, so the area was destined to become a regular stop for the band: In 1969 they played in a ballroom at the university in Boulder; in 1970 the Dead were one of the few bands that could actually fill a giant former skating rink called Mammoth Gardens; and in 1972 the group had become so popular that they played Boulder’s Folsom Field--a three-set marathon still talked about in hushed, reverent whispers by those lucky enough to have attended. Fourteen months after that triumphant afternoon in Boulder, the Dead made a Western swing that took them from Winterland in S.F. (11/9-11)--shows immortalized on The Complete Winterland 1973 boxed set--to the San Diego Sports Arena (11/14), Pauley Pavilion at UCLA (11/17), the Denver Coliseum (11/20-21), the El Paso County Coliseum (11/23), and Feyline Field in Tempe, Arizona (11/25). The 10,000-capacity Denver Coliseum probably wasn’t on anyone’s list of favorite venues in those days. The cavernous concrete structure was originally built (it opened in 1952) by the city of Denver to accommodate the ever-expanding National Western Stock Show, which was the biggest livestock event in the West. But the Coliseum quickly became a popular spot to stage rodeos, circuses, wrestling matches, basketball games, ice shows, and other large events--including rock concerts, beginning in the mid-‘60s. With its curved concrete roof that rises to 87 feet at its highest and slopes gently down from that apex on either side, it has always been an acoustically challenging spot, yet by the time the Dead came through there, it had already hosted many top acts, including The Rolling Stones, Cream, The Lovin’ Spoonful, CSNY, and Santana. And besides, the sound system the Dead were carting around that fall was guaranteed to make the band sound good in any environment. By November 1973 the Dead were well into the serious development phase of what would become their gargantuan Wall of Sound the following year. It seemed as though the stacks of loudspeakers and amplifiers the band carried were growing exponentially with each tour that year. And though the number of speaker required depended on the size of the venue, for a facility like the Denver Coliseum, the Dead’s standard 85-foot-wide stage plot probably would’ve found the group incorporating somewhere in the neighborhood of 150 of their custom built speakers (of varying sizes) and scads of McIntosh amplifiers to power them. It wasn’t quite as awe-inspiring as 1974’s full Wall (which completely eliminated the side stacks and front monitors in favor of columns of speakers behind the group), but the power and clarity of the pre-Wall array was readily apparent. Notwithstanding the still-painful loss of Pigpen in May ’73, musically the Dead were riding very high that fall. Since the Europe ’72 tour (and the resulting live triple album, which contained many previously unrecorded numbers), they’d introduced a slew of great new songs, including such Hunter-Garcia gems as “Mississippi Half-Step,” “Stella Blue,” “Row Jimmy,” “Eyes of the World,” “They Love Each Other,” “Here Comes Sunshine,” “Loose Lucy,” and “China Doll,” and Weir had completed his wonderful three-part opus known as “Weather Report Suite,” cowritten with lyricists John Barlow and Eric Andersen. Free at last from their obligations to Warner Bros., the Dead started their own record label and spent the entire month of August sequestered in Sausalito’s beautiful Record Plant Studios cutting their superb Wake Of The Flood album, which was released on October 15. So the band was understandably pumped when they hit the road again that fall--new company, new album to promote, evolving sound system, and, in the case of Garcia, Weir, and Phil Lesh, new instruments, to boot! Garcia introduced his beautiful, custom Doug Irwin-made axe (later nicknamed “Wolf” for a comical sticker--eventually turned into a colorful inlay--Garcia put below the tailpiece); Phil started breaking in a custom Alembic quad bass, known as the “Mission Control” bass (though he still often played his original “Big Brown” Alembic model through 1974); and Bob switched from a Gibson SG to a sunburst Gibson 335. 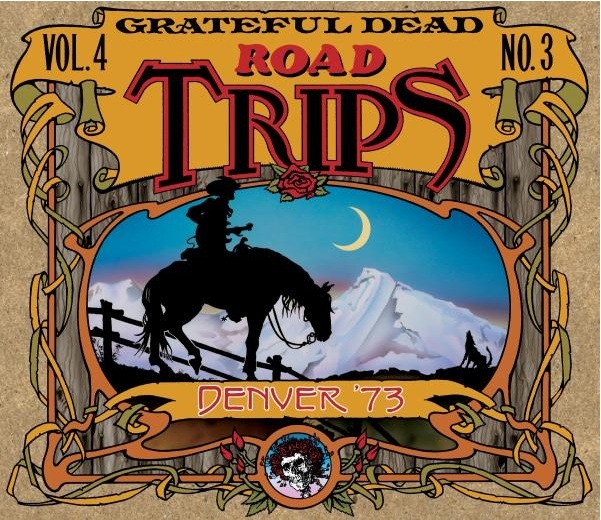 This Road Trips release presents the entire 11/21/73 show over two-and-a-half discs, with a substantive chunk of the second set from the first night (11/20) rounding out Disc Three. The first set of 11/21 offers a rare “Me and My Uncle” opener (with its much-appreciated “hometown” reference to “south Colorado”) and several other tunes that feel somehow fitting for the wide-open spaces of this state where the Great Outdoors is everything--”Jack Straw,” “Big River,” “Mexicali Blues,” a sweet “Brokedown Palace,” and the dynamic “Weather Report Suite,” which seemed to get tighter at each show at the same time it was also beginning to open up more and more (a classic Dead paradox). The lilting “Here Comes Sunshine” is given a lacey, delicate treatment here, with the interplay between the instruments beautifully articulated as the song moves through its different sections. And it’s always nice to hear one of the early versions of “They Love Each Other,” when it had a bit more giddyup in its pacing, as well as its soon-to-be-abandoned bridge. That should certainly have been enough to send an audience home happy, but the band had other ideas: It starts with an exciting, crowd-pleasing “Truckin'” that no doubt got every person from the overcrowded lip of the stage to the back row of the arena shakin’ and boogyin’ followed by Garcia singing only the second known version (since the band’s earliest days) of “Nobody’s Fault But Mine,” a gritty blues originally recorded in 1927 by the great Texas street singer and evangelist Blind Willie Johnson. That dark tune gives way to a jubilant “Goin’ Down the Road Feelin’ Bad” (check out Jerry’s last solo!) and a special Wednesday edition of “Saturday Night.” The encore is “Uncle John’s Band,” and you can practically feel the warmth between the band and fans. The “filler” on Disc Three from the previous night offers a second “Truckin’,” but it goes to some completely different places--after hinting, but never arriving, at “Nobody’s Fault,” the jam heads into a tremendous duet between Phil and Bill, rolls into a long journey through “The Other One” (including “space” tangents and a short “Mind Left Body” jam) and, finally, a perfect “Stella Blue” to close the disc. At the end of the 11/21 encore, Bobby says, “Thank y’all; see ya next time we’re in town.” And while it would be four long years before the Dead made it back to Colorado, that’s OK--they went there plenty after that, including 20 unforgettable shows at Red Rocks, plus others in Boulder, at McNichols Arena, Telluride, and, finally, Mile High Stadium. This album was released in April 2011.